[S11] John J. Weidner, Compiled Birth, Death, 546, 661, 662, 676. [S390] Simon Hennemann, Havre Microfilm, 02 Jun 1846, 62. [S529] 12 Sep 1850 Federal Census, Arlington Heights, Cook County, Illinois, USA, Cook County, Illinois, Wheeling Township, page 95, dwelling, 508, family 517. [S441] Gretchen Leisen, "Pioneer Progenitors: The Hennemann and Weidner Families' Pater Familias", date only. [S529] 12 Sep 1850 Federal Census, Arlington Heights, Cook County, Illinois, USA, Cook County, Illinois, Wheeling Township, page 95, dwelling, 508, family 517, 1850 census states she is 23 years old and born in Germany. 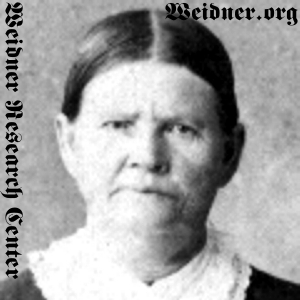 [S441] Gretchen Leisen, "Pioneer Progenitors: The Hennemann and Weidner Families' Pater Familias", states she died on 23 April 1892; death date only. [S474] Letter, S. SJS, Priscilla Burke to 938 Canterbury Lane, Waukesha, WI 53188-5520 Patricia Weidner-Waite, 02 Aug 2001, age and cause of death only. [S510] Ursula Weidner, State of Minnesota, County of Stearns, Lake Henry Village, cause of death, date, and location.